In modern times, the quarter dollar has established itself as a workhorse in the U.S. coinage system. It plays a vital role in turning the wheels of commerce, and its annual production routinely tops 1 billion. By contrast, the quarter was all but invisible during the early years of federal coinage. The United States Mint delayed its introduction until 1796, making it one of the last U.S.coins to debut. Then, after striking just 6,146 examples of that date, the Mint suspended production of 25-cent pieces for nearly a decade. As numismatic researcher R.W. Julian has observed, quarter dollars were “orphans” in the new nation’s monetary system. “Few were struck and even fewer were seen in the marketplace actually being used by merchant or citizen.” In large measure, the early public indifference to this now-essential coin was attributable to the fact that Americans didn’t need it at that time. The Spanish two-reales piece, which circulated widely in the infant United States, had exactly the same purchasing power25 centsand then as now, people tended to favor things (including coins) with which they were more familiar. Under the circumstances, there was no particular urgency to strike quarter dollars at all, as evidenced by the fact that from 1796 to 1814, a period of nearly 20 years, the Mint produced quarters for only five dates and in quantities totaling barely half a million pieces. Indeed, the paltry output in 1796 seems to have been intended primarily to establish the denomination’s existence, just to show the flag, so to speak. 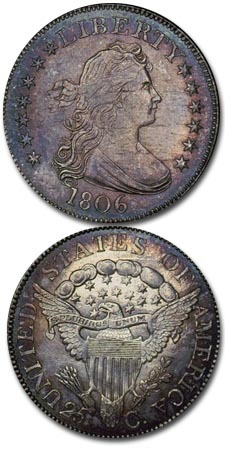 U.S. coin designs underwent frequent changes during the nation’s formative years, and because of its late introduction, the quarter missed the very first cycle in this process: Unlike the dollar, half dollar and half dime, the 25-cent piece never appeared with the Flowing Hair portrait of Miss Liberty. By 1796, the Mint had already replaced that design with a new Draped Bust likeness of Liberty. A small, naturalistic eagle, much like the one on the Flowing Hair coinage, continued to grace the reverses of the first Draped Bust issues. This included the quarter dollar of 1796, which turned out to be a one-year type coin. After completing the minuscule mintage of the first U.S. quarter, Mint officials seemingly forgot about the 25-cent denomination. It didn’t reappear in the nation’s coinage lineup until 1804, and by then the “small eagle” of the first silver coins had given way to a larger heraldic eagle based on the Great Seal of the United States. The Draped Bust image of Liberty is essentially the same in both series and was fashioned by noted portraitist Gilbert Stuart, possibly at the urging of President George Washington himself. It’s said that Stuart’s model was Ann Willing Bingham of Philadelphia, a socialite regarded as one of the most beautiful women of her day. His sketch was converted to plaster by artist John Eckstein of Providence, Rhode Island, and coinage dies then were executed by Mint Chief Engraver Robert Scot. Stuart reportedly felt that the execution was more akin to the type performed by a hangman, killing off the artistry of his portrait. For that reason, he disavowed his connection with the design. In his highly regarded book Numismatic Art in America, Boston museum curator Cornelius Vermeule likens the Draped Bust figure to “a buxom Roman matron.” Her long, elegant tresses are tied back with a ribbon and ample cleavage is visible above a fold of drapery in her gown. This right-facing portrait is encircled by LIBERTY above, the date below and stars along the left and right borders. On the Small Eagle quarter of 1796, the obverse displays 15 stars, one for each state in the Union at that time. By 1804, the Mint had settled on 13 stars representing the 13 original states; the notion of adding a star every time a state joined the Union had been scrapped as an impractical indulgence. Thirteen stars appear on the reverse of the Heraldic Eagle quarter, as well, tucked into the space above the eagle’s head. There are clouds above the eagle, while UNITED STATES OF AMERICA and 25 C. are inscribed around the periphery. A shield is superimposed upon the eagle’s breast, a banner in its beak proclaims E PLURIBUS UNUM and it grasps symbolic items: a sheaf of arrows and an olive branch. In designing the coin, Chief Engraver Scot chose to place the warlike arrows in the right (or “dexter”) claw and the olive branch of peace in the left (or “sinister”) claw. This reverses the traditional American priorities, since the right claw is dominant in heraldry and thus more properly suited for a symbol of peace, not war. Areas on this design to first show wear are Liberty’s bust and shoulder and her hair above the forehead. On the reverse, check the eagle’s head and the tops of the wings. The Draped Bust Heraldic Eagle quarter remained in production for only four years, and during that time its annual mintage never reached a quarter of a million. Only 6,738 examples were struck in 1804, making that the key date of the series. Thereafter, the output topped 100,000 every year, reaching a high of 220,643 in 1807. Combined production for all four years totaled only 554,899. Mint records make no mention of proofs. Heraldic Eagle Draped Bust quarters are exceedingly scarce in mint condition and all but unheard of in grade levels above Mint State-65. A complete date-and-mint set actually includes five coins, since 1806 quarters come with both a normal date and a 6-over-5 overdate. Although it wouldn’t be an impossible task to assemble a set of all five issues, many prefer to treat this as a type coin and acquire just one high-grade example to represent the series as a whole. For those quarter devotees who prefer complexity to simplicity, the late Walter Breen, a renowned numismatic scholar, identified 19 different die varieties for the series. After completing production of quarters for 1807, the Mint put this underused denomination back on the shelf for another long hiatus. People still preferred the Spanish and Mexican two-reales coins. As a further disincentive to production, the few quarters already issued were being widely hoarded, rather than spent, because they contained more silver than the two-reales pieces. Despite being lighter in weight, the Spanish coins were still legal tender at par, so it made more sense to spend those and save the quarters. The Mint wouldn’t issue quarters again until 1815, and when it did, they would come in a new version: John Reich’s Capped Bust design.